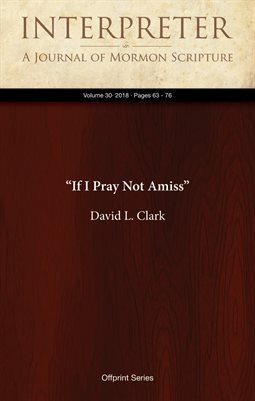 Abstract: In 2nd Nephi, it is suggested that the Lord answers prayers but that requests made in prayer should not violate some kind of standard that would make them “amiss.” This undefined standard most likely excludes many prayers requesting immunity from those conditions of mortality which all mortals accepted and embraced with great enthusiasm in the great Council in Heaven. However, except for limited latter-day explanations of that great conference, our eager acceptance of all details of the conditions of mortality did not carry over into mortal memory. Consequently, when we request exemption from those conditions joyfully endorsed in premortal time, perhaps many qualify for the “prayers amiss” category. Exceptions from mortal conditions are granted only for divine and sometimes incomprehensible purposes.